The Scandic Copenhagen sits in the center of Copenhagen, within easy walking distance of the Tivoli Gardens and just across the street from The Lakes, a chain of peaceful waterways popular with pedestrians and bicyclists. This contemporary hotel’s amenities include a restaurant and bar, fitness center, sauna, bicycles for rent, complimentary Wi-Fi internet access, and laundry service. Air-conditioned guest rooms have private bath with hair dryer, in-room safe, ironing facilities, TV, and phone. A modern overnight cruise ferry holding some 2,000 passengers, the DFDS ferry traveling between Copenhagen and Oslo offers a host of amenities and activities, including several restaurants and bars, nightclub, cinema, three small indoor pools, Jacuzzi, sauna, and tax-free shopping. Each small yet comfortable cabin has a private toilet and shower, and sea view. This century-old hotel enjoys a tranquil and serene mountain setting in the heart of Norway’s ski country. The hotel prides itself on offering guests hospitality in a traditional Norwegian setting. Amenities include a swimming pool, sauna, tennis, and miniature golf; restaurant, fireplace lounge, and bar. The hotel also offers laundry and dry cleaning service and Internet access. The 100 guest rooms have private bath with hair dryer (upon request), mini-bar, TV, and phone. 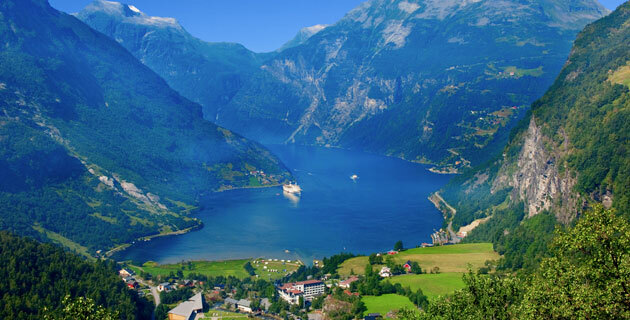 Dating to 1891 and rebuilt in 1979, the fourth-generation family-run Hotel Union sits amidst the splendid scenery of Geirangerfjord, a UNESCO World Heritage site. Amenities and facilities of the 197-room hotel include indoor and outdoor pools, spa, several restaurants and bars, Internet access, and a collection of vintage cars (including a 1919 Cadillac) once used to drive visitors around the area. Comfortable guest rooms have private bath with hair dryer, TV, and phone. Please note that due to the unique nature of the hotel, rooms may vary. The recently renovated Radisson Blu Royal is superbly located in the city center of Bergen near the historic wharf area. The hotel offers two restaurants and a bar; a fitness center with sauna and solarium; a safe at reception; room service; and laundry service. Each of the 263 guest rooms has private bath, tea- and coffee-making facilities, mini-bar, TV, and phone. Family run for five generations, this gracious 172-room hotel sits on the eastern shore of Sorfjorden, part of majestic Hardangerfjord. The hotel has two restaurants, a bar, and several lounges; Internet access; indoor swimming pool; indoor tennis court; fitness room; golf simulator; Jacuzzi; sauna; and solarium. During the summer guests can lounge in the delightful fjord garden (where composer Edvard Grieg’s cottage still stands), swim in the surprisingly comfortable waters of the fjord, or explore the fjord by row boat or paddle boat. Guest rooms have private bath with hair dryer, mini-bar, TV, and phone. The Clarion Hotel, The Hub recently underwent a full renovation to provide guests an exceptional stay in the heart of downtown Oslo, only a short walk from shops and dining on Oslo’s main street; Karl Johans gate; the Royal Palace; museums; the waterfront Aker Brygge area; and many other attractions. The redesigned common areas combine sleek contemporary styling with comfortable furnishings, and the hotel’s amenities include three restaurants and bars, fitness center, sauna, steam room, indoor swimming pool, complimentary Wi-Fi internet access, and laundry and dry cleaning services (for a fee). Air-conditioned guest rooms have private bath with hair dryer, minibar, tea- and coffee-making facilities, TV, and phone. Called “the most promising property to emerge from Stockholm’s recent hotel boom,” At Six Hotel opened in March 2017 in an ideal location in downtown Stockholm. The hotel boasts clean, modern interiors and a host of amenities including a restaurant, cocktail bar, wine bar/coffee shop/deli, music listening lounge, fitness center, sauna, laundry and dry cleaning service (for a fee), and complimentary Wi-Fi internet access. Air-conditioned guest rooms are decorated in relaxing hues and feature private bath with hair dryer, tea- and coffee-making facilities, minibar, TV, and phone. Add an independent stay in the delightful Swedish capital to your Scandinavian sojourn. The history of the Vikings told through a series of innovative maps and excellent photographs. This book traces the routes of the ninth-century Viking merchants and explorers throughout Europe and onto the New World. Scandinavia from prehistory to the present with chapters on the Viking and Lutheran kingdoms, medieval times, monarchies, the World Wars and modern period, emphasizing the common cultural, political and social backgrounds. This handsome, illustrated guide covers nature, culture, history and attractions. A handsome map of Norway at a scale of 1:1,000,000, with a place index and shaded relief. With information on key sights and a full-color, pull-out map, this is the guide to take along. By a celebrated Norwegian food writer, this handsomely illustrated compendium pairs recipes with an engaging history of Scandinavian cuisine. Jones integrates history and archaeology in this classic portrait of the Vikings. Bagge spends little time with myths in this scholarly history, but focuses on the development of northern European societies and their rise from the Dark Ages to the Reformation. A classic biography of the last Viking warrior King Harald and an account of the 1066 conflict between Norway and England. Guardian journalist Michael Booth writes with laugh-out-loud humor and brutal candor about the Scandinavians, mixing history and his own experiences in Nordic regions in this searing cultural portrait. A Minnesotan of Norwegian extraction, Dregni writes entertainingly of Norwegian culture and the immigrant experience in this delightful account of a year living with his wife and infant son in Trondheim on a Fulbright scholarship. Groundbreaking feminist Wollstonecraft records her observations of a late 18th-century journey through Scandinavia in this small masterpiece, rich in detail of people and place. This is an illustrated biography of Norway’s best known artist, with excellent reproductions of his work and plenty of historical information. In her U.S. debut, Norwegian mystery author Karen Fossum weaves a tale of intrigue set in a small mountain town outside of Oslo. An odd character settles in a small Norwegian village and charms the locals. First published in 1890, this book is an insightful look at life in Norway and our favorite of Hamsun’s many novels. This rich collection of stories, interpreted by a leading scholar on ancient traditions and tales, will delight both adults and children. A deliberate and astonishing novel. Looking back on his early childhood in rural Norway, Trond Sander fixates on a fateful childhood summer. In 1948, after the death of a child, his father’s decision to abandon the family and the crippling guilt of his best friend, the course of Sander’s life would be altered forever. This classic collection includes 32 tales of Nordic gods, goddesses and heroes. With an overview of the Norse world, cosmology and gods. In this captivating collection of oversized aerial photographs, Haas (Through the Eyes of the Gods) reveals the surprising diversity of color and life in the arctic landscape, including Norwegian fjords, Alaskan tundras and Swedish waterscapes.